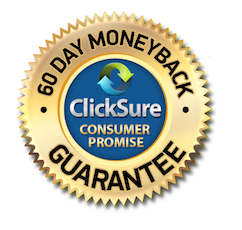 Force5Income System participates in the ClickSure Consumer Promise and offer you a fair 60 Days Money Back Guarantee. Contacted our dedicated customer support team asking for assistance if required. Submitted your request for a refund within 60 days of making your purchase. Provided a valid reason for requesting a return within 60 days of purchase. Provided a valid report that the charge was fraudulent or unauthorized. For any other reason ClickSure Support deems appropriate. Your purchase of Force5Income System is made through ClickSure.com Marketplace. The name that will appear on your statement is clearly shown on the order page for this product and on the payment receipt page. Please Note - ClickSure insists that the Seller and Consumer are treated fairly and honesty. Any consumer who is deemed to be abusing the ClickSure Consumer Promise may have their right to a return revoked and may also be blocked from making future purchases through the ClickSure platform. Once a refund / cancellation request has been processed, the Seller has the right to terminate all services provided and request an immediate return of all products purchased. You will be refunded via the method that you purchased.